Face it, more of us than like to admit it are facing budgetary challenges the likes of which we’d not seen since we first left our parents’ homes. That means we’re trying to find creative ways to stretch the food budget in the face of inflation and reduced incomes. It soon becomes quite apparent that there is a difference in quality between the less expensive and the premium products offered on the grocery store shelves in many cases. One place that it can become apparent is in the meat department. Meat is expensive, and yet many of us crave it. In addition, many “meat substitutes” offered are not appealing and cost more than the meat we used to buy. So we look at the hot dogs. Since premium hot dogs cost over $3 (on average) per package and a package of cheap hot dogs can be a dollar or less, we often decide to try them. While a two year old might not recognize the difference in taste or texture, most adults and older children will. How can we make those cheaper hot dogs taste better? I wrap them in bread dough and bake them right in their own bun. 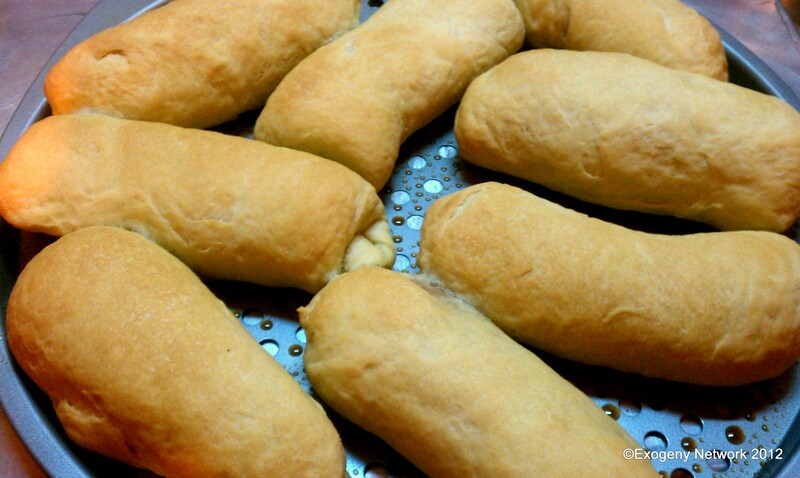 Weiner winks are hot dogs, wrapped in bread dough and baked until golden brown. It’s easy–you can use any homemade bread dough mixture, frozen dough, or even “hot roll mix” from the grocery store shelves. Obviously, the cheapest way to do it is with homemade bread dough. It isn’t even hard, nor does it require a bread maker, heavy duty mixer, or even a mixer! For dough to wrap your hot dogs in, choose any basic bread dough recipe that suits your fancy. It can be “basic white bread”, foccacia, Italian, egg, potato, oatmeal…or whatever. Once the dough has been made and allowed to rise, instead of shaping it into a loaf, simply pinch off a chunk roughly the size of an egg. Roll it between your hands (oil them lightly if the dough tends to be sticky) and then place on a board. Roll the dough into a somewhat roundish shape, about 1/4″ thick. This should be much larger than your hot dog! Place the hot dog on the dough, folding dough over the ends of the hot dog and pressing to seal the dough on either side of the hot dog. Then, roll the remaining dough around the hot dog and pinch to seal the seams. Place the dough covered hot dogs on a lightly greased cookie sheet at least 2″ apart. When all the hot dogs have been wrapped, let the dough rest for about 10 minutes before putting them into a 350 degree F. oven until golden brown. (Usually 20-30 minutes). Serve with your favorite condiments or even chili and see the family go wild, forgiving you for “cheap” hot dogs since they are wrapped in delicious and aromatic fresh bread! Even with these simple instructions, there are additional things that can be done to dress them up more. The same method can be used for chunks of smoked sausage, Polish sausage, pieces of kielbasa, or even pre-cooked Italian sausages. If you want shiny tops on your bread covered hot dogs, brush the tops of the unbaked dough with a thin egg wash (1 tbsp. of beaten egg mixed with 2 tbsp. of water). A “stick” of cheese can be added alongside the hot dog for a “cheesy dog” too. Garlic or chili powder can be sprinkled on the top of the bun for additional flavor. These dough wrapped hot dogs, which I grew up calling “weiner winks”, are a take off on a very old habit of baking pies. Pies don’t necessarily mean the same thing in the past that they typically mean to us today. These dough wrapped portions of meat and vegetables predate the sandwich even, and were the original “fast food” as they could be baked ahead and easily carried in a pocket or lunch pail for later consumption. They even stayed fresher than sliced bread, as the baked crust prevented the bread from drying out as quickly as a slice of bread would. Today, we still see calzones, meat, crawfish, seafood, and other savory pies on the market, and even as fair food. It’s easy to make many versions of these flavor filled pockets at home without breaking the budget too, whether it is made with a typical short crust or with bread dough for a crust. A little creativity can turn some onions and seasonings into a tasty tidbit or a filling dinner, and many other items can become an inexpensive and tasty meal or snack. This entry was posted in Breads, Budget, Easy and tagged bread, budget, easy, family, hot dogs. Bookmark the permalink.